I have been planning this ride for about a year now. I had some side work to do in Madison, Wisconsin so instead of flying, I rode up to do this challenge and poke around up north. I left Saturday, July 1st at 7:40am. My riding friend, Joe (who wanted to do this with me but last minute had to back out for work reasons) met me at the Chevron on Thomasville & Bradfordville Road in Tallahassee, Florida, and would follow me to Tifton, Georgia. I filled my tank and a 2 gallon gas can (insurance!) Joe signed my LDR form and off we went. The weather was perfect with a nice and cool morning breeze. We stop at the Shell station in Tifton, Georgia to gas up, he wishes me good luck and I hit I-75. The roads were great and traffic was at a minimum. As I headed toward Atlanta, Georgia I thought “I haven’t been through the center of Atlanta in a while” and made the decision to go right through the center of town instead of the I-285 bypass. Turned out to be a pretty big mistake. Even around lunch time on a Saturday, traffic is backed up. I easily lost an hour! Finally got through it and was able to set the cruise again. At a stop for gas, I looked at Facebook and saw that John Sands, a former employee at Tallahassee Harley Davidson, had checked in at Thunder Creek Harley Davidson in Chattanooga, Tennessee and thought “Hey, I’ll stop by to see him”. Stopped in, said hi, bought a shirt and looked at radar. I knew I was going to get hit with rain and it was right up the road. It didn’t look too bad so I only put on my rain coat and ¾ helmet figuring I’d be out of it quickly and my jeans would dry off in no time. Well, what I didn’t expect was that the storm grew over me and traffic slowed to a crawl through the mountains. I was soaked all the way to my toes! I was in the rain on and off (mostly on) through Tennessee and part of Kentucky. At a gas stop in Kentucky, I was able to take my rain coat off and switch back to my half helmet. The cooler breeze felt great and I could feel myself drying out a little. Going through Ohio there was very little traffic and I was making good time. It’s dark and really cooling off. When I got to the boarder of Ohio and Michigan, I stopped for gas and dug a pair of sneakers out of my luggage. I had thought about doing it earlier but hoped my boots would dry out in the breeze… no luck of that. They were buried under that 2 gallon gas tank and a duffle bag that was strapped down. Not easily gotten to, but I had to get my feet dried out before my toes fell off! With dry socks and sneakers on, I strapped the boots to the top of some luggage on the tour pack and took off again. I grew up in Michigan and knew the areas well so it gave me confidence riding through the night. Rode over the Zilwaukee Bridge, which is one of the most spectacular bridges in the world. This high-level, segmental concrete bridge spans the Saginaw River. Then I started getting into areas of Michigan that are sparsely populated. This is the reason for the 2 gallon gas can. Wasn’t sure what time I’d be riding through these desolate areas and 24 hour gas stations are few and far between. I stopped for gas around 5 am and could see the sun coming up in the distance. Still cloudy, but the deep reds and blues of the morning sun were beautiful! Going up I-75, I’m the only vehicle on the road. There were times I’d go for 15-20 minutes before seeing a car. My second biggest worry about getting into northern Michigan, were the deer. As the sun really started to come up the deer started to come out. Growing up here, I learned to watch for deer at all times and wow, they were everywhere! Most stayed off below the roadway, one darted in front of me maybe 50-60 ft. Another two stood on the shoulder and as I got closer, they turned and took a few steps into the grass. I was a nervous wreck all the way to Mackinaw City! Rolling into Mackinaw city, I stop to fuel up and check radar. I knew there would be rain and sure enough, huge cells are moving west to east. 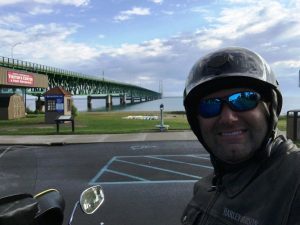 I pull into a park near the Mackinaw Bridge for a photo op and to put all my rain gear back on. Boots were dry enough to wear too! I’ve driven over the bridge many times, but never on a motorcycle. I was a bit nervous knowing how the winds can whip through there. I also wanted to stay on the paved side of the road. The two inner lanes are steal grating, the outer are paved. I make my approach and in the right lane there are a line of semis doing about 10mph, so into the left lane I go, riding the grating the whole way. Motorcycles swim all over those grates and it made me pretty nervous. I got over the bridge without a hitch, paid my fare and hung a left onto Hwy 2. I was closing in on the storms and when I hit the edge I was ready. Then I heard the tinkling of hail on my helmet and literally busted out laughing! It only lasted a minute and I rode the rest of the storm out. 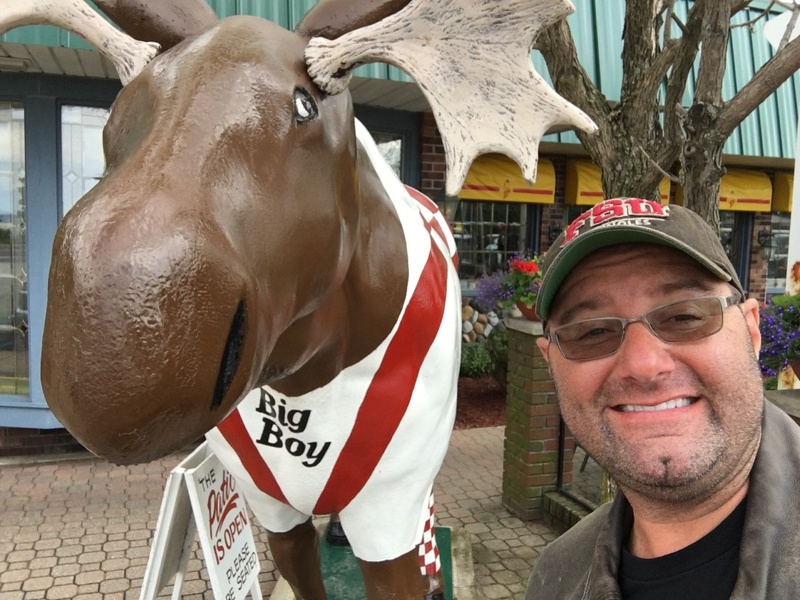 In Manistique, the clouds lifted and I ate breakfast at Big Boy. Instead of the usual statue out front, it’s a moose dressed as Big Boy. Took advantage of the photo op and hit the road. The weather is beautiful and it’s the last time I’d see rain. Now I’ve been up for well over 24 hours. I’ve got food in my belly and, while beautiful, there isn’t much to see from the road. Between Escanaba and Menominee was the first time I started to feel tired. Knowing I had lots of time, I would stop here and there to walk around and wake up a bit. Getting into Green Bay, I wanted to get a picture in front of Lambeau Field but I missed the exit. South of Sheboygan, I started getting tired again. For a year I knew I was going to end my ride at the Harley Davidson Museum but the exhaustion was starting to get the best of me. My motel was 5 miles north of town and I plugged that into the GPS thinking that was the best thing to do. A couple miles from my exit and my mind is going – “No! I told myself I was going to end this at the museum and that’s what I’m going to do!” I buzzed past my exit, reset the GPS, changed the tunes to Motley Crue, cranked it up and got a whole new burst of energy! I made my way into the museum, parked, took off my rain pants and while talking to a guy next to me, he said “if you’ve got your HOG membership card, you can go in and get a free pin”. Yes please! I go inside and a young women behind the counter helped me with getting a pin and I asked her if she’d sign my paperwork for this AWESOME long distance ride. She was pretty excited about my story too. I snapped a pic of my odometer, brought the paperwork into her and she signed it. I grabbed a bit to eat at the restaurant there and now I’m getting really tired. I make my way to the hotel, pile all my stuff onto a dolly, go up to my room for a shower and when I hit the bed I was out. I slept a straight 12+ hours. This was an amazing journey and one more thing to check off my bucket list. Maybe in a couple years it’ll be time for the coast to coast ride! No Replies to "Jim Berhalter's King of the Road Trip"